Products of Choice -- TheraLabs Inc.
Why are TheraLabs products the best choice? 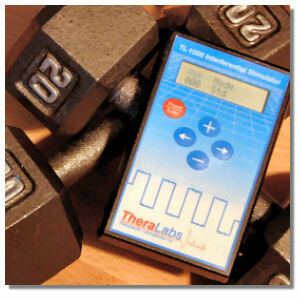 TheraLabs products offer superior performace, features and durability. TheraLabs products are designed and built by Control Solutions, Inc. -- manufacturers of the highest quality electronic devices since 1990. With TheraLabs electrotherapy products, a clinician can select a preprogrammed or custom protocol and then safely turn the device over to the patient for frequent home use. There are no knobs for the user to inadvertantly misadjust. Operation is straightforward and data is recorded for complience reporting. Shutoff is automatic at the conclusion of treatment. TheraLabs products are portable and built to commercial grade standards for reliability and durability.